Umatilla Electric Cooperative members were treated to an evening of comedy Saturday night during the cooperative’s annual meeting thanks to a visit to Hermiston by popular performer Tim Behrens. Behrens brought to life characters from the fictional town of Blight, Idaho (not too far from Famine, Idaho). For the past several decades, Behrens has performed the written work of humorist Patrick F. McManus, who passed away this month at the age of 84. In character, Behrens told the crowd that he grew up so poor he couldn’t afford to play with toys, but he had plenty of dirt and plenty of water and together they made plenty of mud. Behrens met McManus in the 1980s when Behrens was a beginning his career as a performer while also writing for the Spokesman-Review and pursuing a master’s degree from Eastern Washington University where McManus was his adviser. 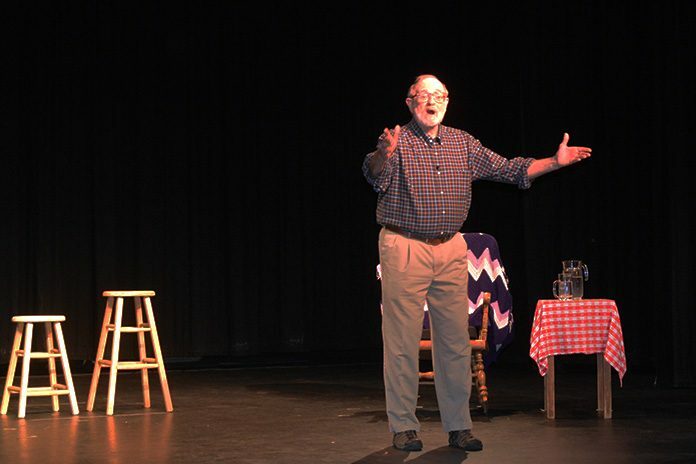 They soon began developing one-man shows in which Behrens would perform McManus’ written words. Over the years, he has given more than 1,000 performances in 23 states.